Naval Air Station Pensacola, often referred to as “The Cradle of Naval Aviation” employs more than 16,000 military and 7,400 civilian personnel permitting them to bring their families and their business right here to Escambia County. NAS Pensacola also serves as the home of the Blue Angels Squadron, who performs extraordinary flight demonstrations for tourists and spectators across the country! Because of the strong military aviation presence on this base, Pensacola is also home to famous tourist attractions such as the National Naval Aviation Museum, the Pensacola Lighthouse, Fort Barrancas National Park and Barrancas National Cemetery. As the local military presence brings in thousands of military personnel including their families, it is important to recognize the role the military appearance plays in our community. This type of visitor/resident keeps many of our local businesses afloat year-round and is an important piece to our economy and our community as a whole. May 18, 2019, is nationally recognized as Armed Forces appreciation day. The Perdido Key Area Chamber of Commerce along with the office of Morale, Welfare and Recreation (MWR) of NAS Pensacola and other community businesses and organizations, are working together to create an event like no other to show our military personnel, how important their existence in our community is to us. 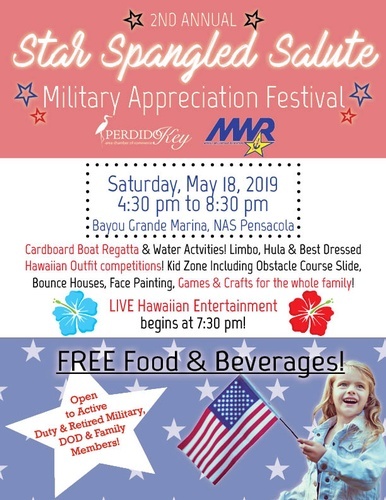 The Star Spangled Salute, Military Appreciation Festival will be free and open to active duty and retired military, DOD and their family members, saluting those who served time in the military for the betterment of our lives all across the country. The festival will host a day of games and activities, food and entertainment for both kids and adults. The Perdido Key community of organizations, businesses, and volunteers will be working together to show appreciation to families so that they can enjoy a day together, that they may not always get to do otherwise. These service men and women have served your country, your community, and your business. Any business or individual should take advantage of this community gathering as a great opportunity to give back to those who keep on giving. Help the Perdido Key Chamber build funds to host this event in representation of the community who LOVES our military! Ways to give towards the cause are endless! The festival will be hosted at the Bayou Grande Marina, at NAS Pensacola on, Saturday May 18, 2019, from 3:30 pm to 8:30 pm. Contact us today to help create an event that will surely mean the world to our military community. Open to all active duty and retired military, DOD and their families!